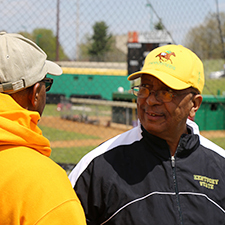 Charles Trumbo was a multi-sport athlete at Bourbon County High School in Paris before arriving at Kentucky State University in 1965. While he focused on football at Kentucky State, he also participated in intramural track and basketball during his four years on the Hill. His intramural basketball team, he said, won 39 games and lost one over the course of three years. He contends that the team is the best intramural basketball team in the history of Kentucky State. Since Trumbo left in 1969, he’s kept coming back to the sidelines to cheer. “I come to every home basketball game and football game they have,” Trumbo said. It’s not just those events, however. Trumbo is a presence on the sideline, making an impression on student-athletes and coaches, alike. Fatimah Shabazz, a former Thorobred athlete and current interim head coach for cross country and track and field, has known Trumbo for 11 years. Shabazz recalls when Trumbo attended a cross country meet at Berea College. That meet was the moment, Shabazz said, Trumbo became her favorite Kentucky State alumnus. Trumbo recalls a Berea cross country meet, as well. He recalled watching coaches from other schools sprint along the course to cheer on their runners. The Kentucky State coaches at the time, he said, weren’t moving. “I sprinted over there with the rest of those coaches so I could cheer Kentucky State runners on,” Trumbo said. What is it about the University on the Hill that keeps Trumbo coming back to the sidelines? Football and meeting his wife are the reasons he loves Kentucky State so much, he said. “They gave me an opportunity to continue my education and play football, a sport that I dearly loved,” Trumbo said. The love for Kentucky State runs in the family. Trumbo’s daughter, Mary Jackson, now serves as a development services coordinator on campus. His son-in-law, Jamaal Jackson, is the men’s basketball head coach.